Day 1 and I have already been mistaken for a boy – twice. Nevertheless, it is not as bad as one would imagine, despite the overwhelming number of weird looks I receive on the MRT home and the chill of the wind on a newly botak-head. In fact, there are rather many perks – saving money on shampoo, saving time in the shower, saving sleep in the morning with no need to fuss over one’s non-existent hair. So it is indeed shaving to save after all, in the most literal sense. Of course, besides these superficial ‘saves’, I did set out to shave for other reasons, first and foremost to take a (small) step in challenging the social stigma associated with baldness, especially for girls. This is precisely what Hair For Hope is trying to dispel, to lessen the pressures that children with cancer face of being judged by society because of something they can’t help, something that they need to help them get better. I don’t think we can ever fathom the sort of burden children with cancer carry, and to us, the fear of judgement may not seem like a big deal, but it is something that adds to their hardship. The stresses that they face are already daunting enough. The uncertainty of the future. Undergoing regular treatment. Disruption to regular life. Surely the additional questioning of self-worth which comes with hair loss and the resulting fear of society’s judgement is something that they shouldn’t have to face. It is also one aspect of their burden that we can actively reduce, if we all judge people on their appearances less. How useful are looks as an indicator of what a person is like anyway? Despite this radically new look, I am pretty much still the same person. 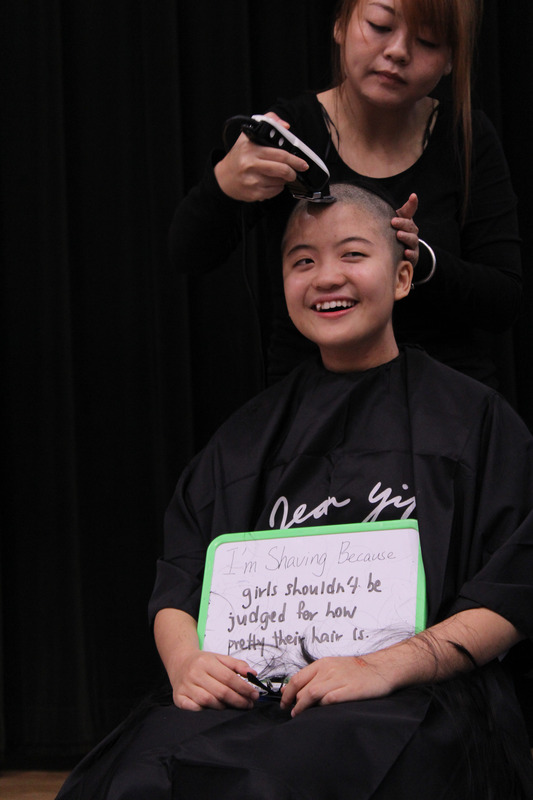 Undoubtedly, the event may not be perfect in fulfilling its aim, but it is a step in the right direction, to show children with cancer that there are people who accept them for their bald heads. Hair for Hope, whilst introducing dots of bald heads into the sea of black hair, also serves as a constant reminder of the greatest gift of all – good health. Children with cancer are often out of sight, and thus, out of mind. We’re so caught up in our own lives that we often forget to appreciate the most important blessing we have – our health. Cancer patients, who are just as old, or ever younger than we are, who have to face battles way more serious than our conquests of tutorials and tests. I hope that when people see me they will remember that the problems we face are not so unconquerable after all, and appreciate the strength and health we possess to accomplish things. Hopefully, the people I meet will be pondering that thought, instead of trying to discern my (non-existent) boyhood from afar. But enough of the abstract reasons, here is a report on the reactions to my bald head and a reflection on how much we overvalue appearances. Prior to the event, many family members, friends and acquaintances were supportive and receptive to the cause. It was really encouraging that awareness was being generated one particular word that kept recurring was the word ‘brave’ in describing this pursuit. According to our favourite source, Wikipedia, bravery is “the ability to confront fear, pain, danger, uncertainty, or intimidation.” Although the support was heartening, I wondered – did people think that I would have to confront a whole array of bad-adjectives generated by judgement of my new appearances? Even in their support (which I appreciate very much), people have yet to reduce their valuing of appearances, if only indicated by their unconscious labelling of this act as ‘brave’. I didn’t feel very brave, because in showing my support through Hair for Hope I did not feel as if I was confronting fear, pain, danger, uncertainty and certainly not intimidation. I was trying to show them that bald people do not need to face this onslaught of emotions, especially not children who have no choice in the matter, if only we let go of our prejudice against bald heads. On the flipside, there were also numerous friends, girls and guys alike, who expressed sadness at the thought of my impending self-induced hair loss. This latter group cited reasons such as how I would look ‘weird’ and unfeminine in their half-hearted attempts at objection. Surely they knew I was shaving precisely to combat the notion that girls have to have hair in order to be normal, let alone feminine or pretty. Subsequently, our culture subtly, perhaps unintentionally, antagonizes not only cancer patients, but others with illnesses that affect their appearances, preventing them from truly feeling comfortable with their bodies. Do I feel any less of a girl without hair than when I did? Nope – I may look like a dude but I still think the same, talk the same and walk the same.